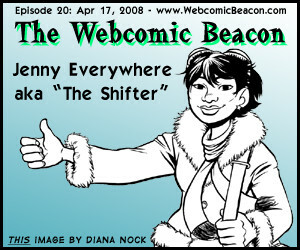 WCBN: Jenny Everywhere and interviews with her early creators! Fes and Aaron along with Jenny Everywhere comic creators Steve Wintle, Nelson Evergreen, Scott D. M. Simmons, and Benj Christensen. We discuss Jenny Everywhere: the Open source, Public Domain webcomic sensation. The origin, the character, the comics, and the idea. Take a listen to the show and see how you can join the party! Mark Savary brings us a review of Sarah Zero; and Peter Tarkulich gives his impression of The Sealed Gate. One Milestone this week: Poharex turns 1 year! Thanks to Diana Nock for this week’s cover! Her own rendition of Jenny Everywhere! Current Jenny Everywhere projects: The Jenny Everywhere Chronicles and The Crossing Over Worlds. Also, it must be known that Nelson Evergreen’s “Jenny Nowhere” idea is released as open source. So have fun and see what you can do! Sites mentioned this week: Jenny Everywhere, Jenny Origin, Jenny FAQs, Soulless Mate, Names Not Down, Dame Fine Hostile Takeover, Barbelith Community, Cars, The Shifter Archive (Check here for up-to-date news), The Scandal Sheet, Infinity Apartment, He is Just a Rat, Exclaim! article, New York Times article, Wikipedia article, The Death of Jenny Everywhere, The “Nudist” colony one (MATURE! ), Old JennyEverywhere.com site, When Casting Calls, The Nipped Nap, and Bear and Kitten. Great post. I’ve been looking for this exact information for a while now. I’ll bookmark it in the public bookmarking sites to get you more traffic.